In many applications, brush is simply the best solution. For instance, when closing gaps between two moving surfaces, conventional solid seals often break down quickly from friction and abrasion and can exert excessive drag and wear on parts. Sealeze brushes can be manufactured to be pliable and highly effective at closing gaps between uneven surfaces- keeping out dust, dirt and other contaminants while allowing a full range of motion for moving parts. Other examples include: shielding in paint booths and machine tools, guiding product on conveyor systems, closing gaps between moving surfaces, static dissipation, augers for moving delicate product, closing large gaps in commercial buildings (airplane hangar doors, for example) and much, much more. The choices are almost infinite. The special properties of brush come from the almost infinite variety of materials that can make up the final product. Brushes can be designed and formed specially to solve a particular problem. In the case of strip brush, the core wire, metal backing or channel, and filament can all be changed to meet a particular need. Alternatively, we offer a flexible brush that has no metal components. 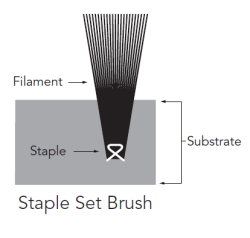 With staple set-type brushes, the substrate and filament (or bristle) configuration produce different results. Strip brush channel materials can range in size from small (less than 0.095 inch wide) to large (more than 0.5 inch wide). As channel size increases, physical strength is greater as is the ability to make brush with filament materials that are larger in diameter, longer and to put more filament material in the brush to make it denser. Substrates for staple set brushes can be made from wood, steel, polymers or other materials. The best substrate would be dictated by where and how the brush is used. 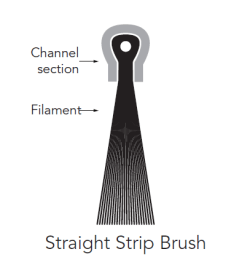 An array of filament materials are available for both staple set brush and strip brushes. The filament materials all have different properties providing a brush with different characteristics. Synthetic filaments, such as nylon, polypropylene and polyester, each have different properties of stiffness, absorption and resistance to heat/cold and chemical agents and are available in a wide range of diameters. Also metal filaments and natural filaments such as horse hair and plant fiber possess their own unique properties. 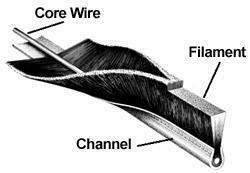 All of these fibers can be trimmed to various lengths to further provide variation in stiffness and other properties. And, brushes can have more or less filament to control density, stiffness, etc. In addition to the almost infinite variations in size and physical properties, brush can be formed into almost any shape – spirals, coils, arcs, rectangles, circles and other configurations for strip brush. Staple set brushes can take the form of discs, blocks, cylinders, and other specialty shapes. The durability of brush in applications where moving parts are involved is unsurpassed. Independent laboratory testing has shown our Therm-L-Brush® brush weatherseal withstands up to 2,000,000 cycles of operation (opening and closing) without excessive wear or degradation.